In a previous article, we learned how to test an interface with Netpipe. In terms of clusters, Netpipe can be considered a micro-benchmark as it only tests a single (but important) component of the cluster. Can we conclude that good Netpipe performance means we have a good cluster? Well, it depends, maybe we can and then again more testing may be needed. Let's consider the fact that Netpipe performance tells us about the maximum limits of TCP/IP performance between two nodes. When we run parallel applications, there is usually more involved than just raw TCP/IP performance. There is usually an MPI layer between your application and the TCP/IP layer. In addition, there are effects due to compilers and node hardware (i.e. dual vs. single) and even the application itself may stress the interconnect in way not measured by Netpipe. Tests that run over multiple comments are usually referred to as macro-benchmarks because they involve a "whole system test" vs a single component test. Both are valuable, but neither may tell the whole story, however. As mentioned, a real applications generally uses MPI or PVM. Unless you are using a kernel bypass version of MPI (like that provided by many of the high performance interconnect vendors) your MPI is probably built on top of TCP/IP. So the next logical question would be, "How does this effect my interconnect performance?" At the micro-benchmark level, the answer only requires a few tests. Netpipe can be used to test MPI implementations as well as TCP/IP. See the sidebar on how to compile a Netpipe MPI version. Once compiled we can run Netpipe with a simple mpirun command. Background on using Netpipe can be found in here. In order to make the testing interesting, we can compare two open source MPI's and one commercial version. We will use MPICH, LAM/MPI, and MPI-PRO from MPI Software Technology. Please keep in mind, the results reported here are not intended to be an MPI evaluation or benchmark. Indeed, the MPI versions we are using are now "old" and we are using them to illustrate a point. It is, therefore, advisable, with the help of this column, to do your own tests on your hardware and with your application set. As we will see, simple assumptions based on single benchmarks may or may not be valid. Using Netpipe we can measure the latency for TCP/IP and several MPI's. See the various sidebars for a description of the test environment and how to compile Netpipe for MPI. The table gives the average latency for three Netpipe runs. 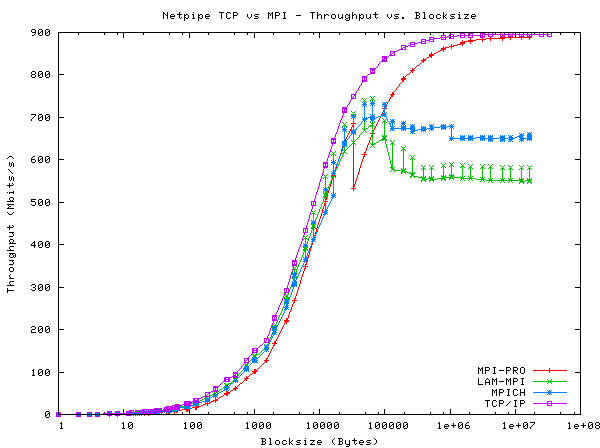 We can see that each MPI adds overhead to the raw TCP/IP latency and MPI/PRO seems to be more than double. If we examine the throughput of each interface in Figure One, we see that each MPI performs less (in some case quite a bit less) than the raw TCP/IP performance. It should be mentioned, that some tuning of the various MPI versions may help with performance, however, Figure One clearly indicates how much MPI performance can vary from that of standard TCP/IP. Although many discussions about cluster networking revolve around latency and throughput characteristics, it is hard to say which MPI performs best from just the Netpipe results. And as we will see, some assumptions about latency may not hold up in some of the macro-benchmarks. To get a better idea of how our interconnect performs with various MPI's, the NAS parallel benchmark suite was used. See the sidebar for more information on where to find information on compiling and running the suite. In general, the NAS suite is a good benchmark for measuring cluster performance because it provides a wide range of problems that represent typical CFD (Computational Fluid Dynamics) codes. The benchmarks are also self checking. In addition, the suite provides two extreme cases that measure network performance. At the one end, the program EP (Embarrassingly Parallel) is virtually latency insensitive as there is a large amount of computation and very little communication. Everything else being equal, EP should provide roughly the same result for each MPI and be more a measure of raw CPU performance. On the other end of the spectrum, is the IS (Integer Sort) program which requires a large amount of communication and relatively little computation. IS is therefore very sensitive to the latency of the interconnect. The results of the NAS suite (Class A) run on four nodes (-np 4 option) are presented in Table Two. The results reported by the each program are Mop/s - mathematical operations per second, bigger is better). The last column indicates which MPI did best on each test. Again, these numbers should not be taken as proof that one MPI is necessarily better than the other. Indeed, many of the results are very close (EP should be similar in all cases) and no MPI tuning was done. The point of the table is that there is no clear winner and one surprise. Looking at the results for IS, we see that MPI-PRO provided the best results even though Netpipe tells us that it has the highest latency. So much for assumptions. How Tall is a Building? One might conclude that it is very difficult to say what provides the I performance on a cluster and you would be right. Think of it as asking "How tall is a building?" There is not enough information to answer the question. Even a little information, may be worse than none at all. Predictions (IS performance) based on our micro-benchmark, were totally wrong. If we were to dig a little deeper, we would find that MPI/PRO uses interrupt based communication while MPICH and LAM/MPI use polling. Interrupt based communication generally provide high raw latency numbers, but provides better processor efficiently. So are micro-benchmarks useful? Micro-benchmarks can put upper limits on expected performance. For example, if Netpipe reported a much higher latency (e.g. some chipsets report 120 μs) for an interface, we would expect IS performance to be very poor regardless of which MPI is employed. Micro-benchmarks are also good for diagnosing errors and tuning a specific part of the cluster. For instance, the Netpipe MPI results show that for large payloads, a reduction of throughput by more than 250 Mbits/second is possible with MPICH and LAM/MPI. If you know your application runs with this payload size, you may want see if you can tune the MPI to help with these numbers. On the other hand, the macro-benchmarks tell a truer story of how the cluster is working, but don't tell how each underlying component effects performance unless we do careful testing. In this case, we found the implementation of the MPI layer is very important and can make big difference in performance. Of course, the ideal test is your application(s). Just as we cannot answer "how tall is a building?" without knowing which building, we can not say what is the fastest cluster without knowing which application is running. From the above analysis we can conclude that assumptions are dangerous and copious testing is the only true way to determine the "right stuff" for your application. Running Netpipe using MPI is actually easier than using TCP/IP as MPI takes care of process spawning on both nodes. To compile the NPmpi program, you will need to edit the Makefile. The following are the Makefile changes that are needed for MPICH and LAM/MPI. Other MPI versions can be used by making similar changes. The test environment included the following hardware and software. Tyan 2720 (i7500) with dual 2.2Ghz Xeon processors, Intel 82544GC GigE Chip. Note: The use of Netpipe for TCP/IP and gnuplot are described in a previous article. This article was originally published in ClusterWorld Magazine. It has been updated and formated for the web. If you want to read more about HPC clusters and Linux you may wish visit Linux Magazine.